Eighty years ago -- on Feb. 27, 1938 -- rain started pouring on Los Angeles. The resulting floods washed out roads, bridges and thousands of homes. The devastation led to total channelization that would forever shape Los Angeles. As part of DnA’s series “Bridges and Walls,” we’re looking at how the concrete channelizing of the river created a wall - between humans and wildlife, and between the east and west sides of Los Angeles. Now there is a convergence of efforts to repair this rift. New parks, businesses, housing and a crop of new bridges, some intended solely for walkers and cyclists, are springing up at the river. But there are also worries this new development will cause further economic and social separation, because the river runs through some of the poorest neighborhoods in Los Angeles. “I grew up here my entire life,” says Hermana Hernandez, a Boyle Heights native. The show begins under the Glendale-Hyperion Bridge, one of the oldest bridges over the LA River, connecting Atwater Village and Silver Lake. 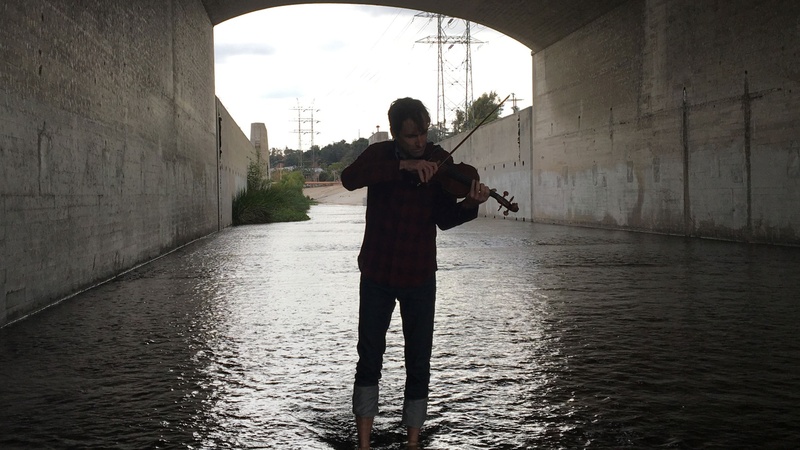 There, under the concrete arches, musician Andrew Bird finds inspiration for a violin composition. 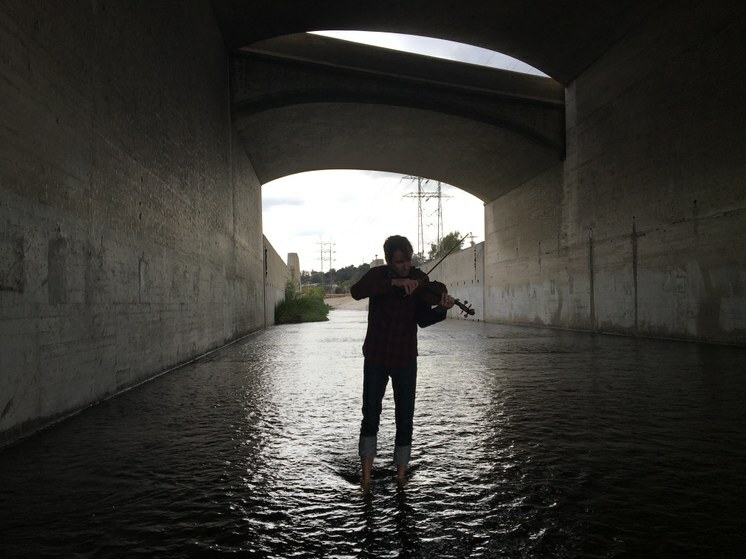 Andrew Bird plays violin under the Glendale-Hyperion Bridge in the Los Angeles River. Photo credit: Avishay Artsy. “L.A. River was originally a natural river that then was turned into this concrete canal. And in the last 10 years or so they've tried to reintroduce nature to what is otherwise a pretty bleak landscape. And they’ve done a pretty good job,” Bird said. This is the fruit of several decades of efforts -- by activists, advocates, city, county and state agencies, artists, architects, landscape designers, developers, non-profits, elected officials, LA 2028 Olympic planners, and the Army Corps of Engineers -- to make the 51-mile river more accessible, pastoral, and unifying. “There's a lot of bridge projects in the works. All are trying to make better connections,” said Deborah Weintraub, chief deputy city engineer for the city of Los Angeles. They include historic bridges over First Street, Spring Street and Main Street that are being retrofitted for earthquake safety, while adding amenities for walkers and cyclists. New bridges are being built over the Glendale Narrows, a “soft-bottom” stretch of the Los Angeles River. Then there’s the flagship Sixth Street Viaduct Replacement project. Its rhythmic progression of 10 paired arches leaping the 3,500-foot span from Boyle Heights to downtown is intended to echo the Art Deco inspired original arched structure. Architect Michael Maltzan spoke to DnA about the design at a big public farewell party for the first bridge. There are people who mourn the passing of the original bridge. But Deborah Weintraub says the new bridges can become new classics. One of the big shifts for today’s bridge builders is that instead of designing them for cars or trains to whizz across, the goal is to incorporate walkers, cyclists, horses sometimes, and to root them in parks. The new bridges and other developments promise to mend a longtime divide caused by the channelizing of the LA. But the river runs through some of the poorest neighborhoods in Los Angeles, and residents worry that once again they will be the losers. DnA looks back at the origins of the river to find out why and finds a history of flooding that inspired a song from Woody Guthrie. When the Native Americans lived in this region there were floods -- after all the whole basin is a flood zone -- and the river never followed a fixed route. But as the next waves of Angelenos added more and more development near the river - - houses and industry and railyards -- floods became a threat, to life and property. A 1914 flood triggered the formation of the county Flood Control District, which began constructing river channels and reservoirs. Then a major flood struck on New Years Eve of 1934, killing over 100 people. Woody Guthrie, the poet and troubadour, was living in Los Angeles and recorded the devastation in a song, the New Years Flood. Then on February 27, 1938, the rains came. Almost a year's worth of precipitation poured over the next few days, washing out roads, bridges and thousands of homes and caused millions of dollars of damage. As a result, the federal Flood Control Act was passed, and over the next twenty years, the U.S. Army Corps of Engineers and other agencies built flood control dams and debris basins, and encased most of the river in concrete. It became a wall between humans and nature, and between West and East LA. For East Angelenos the channelized river only added to a divide already created by railroads and industry and, then, freeways. It also became a favorite Hollywood location, mythologized with riverbed car chase scenes and music video backdrops. After all, what’s more evocative of the urban jungle than a concrete river? “The bridge and the river have played a big role in the psyche of Los Angeles. And most people know the street bridge from car commercials. And yet those that live within it, and were affected by it, view it with a different kind of an understanding and then view the destruction of that bridge as as the first assault of gentrification,” said Harry Gamboa Jr., a conceptual artist. He believes the new bridge and park -- however lovely -- will destabilize the neighborhood because of the pressure from the more affluent arts district. He marked the demolition of the Sixth Street Viaduct with a series of what he calls photonovelas. A troupe of performers staged a series of dinners at the viaduct as it was being demolished. For Gamboa, growing up in Boyle Heights meant the concrete river was far more than an edgy backdrop for movies, videos and commercials. “It actually did serve as a wall. But being the child that I was, I was willing to scale any wall, destroy any wall, and spray paint any wall, and go through walls and transform walls until they were invisible,” he said. And then came other graffiti artists, like SABER. In 1997, he painted a huge artwork at the river’s edge in downtown near the intersection of the 5 and 10 freeways. It was nearly the size of a football field, and it was visible from space. It remained in place for a dozen years, but was finally painted over as part of a massive graffiti removal campaign. 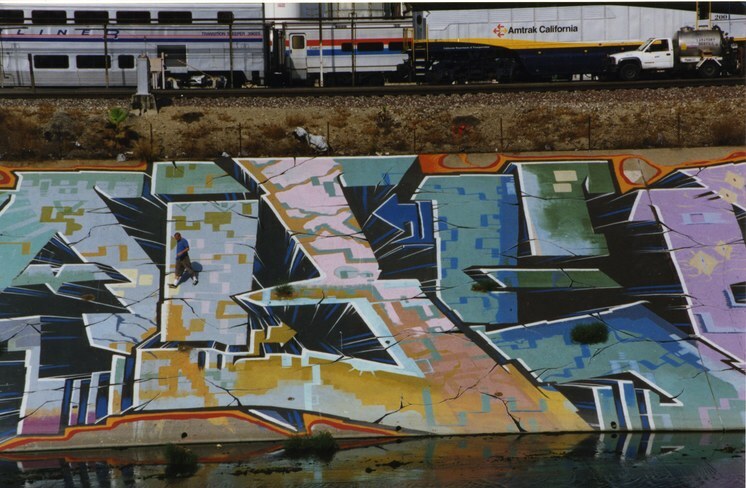 SABER and the illegal wildstyle graffiti piece he made on the LA River in 1997. 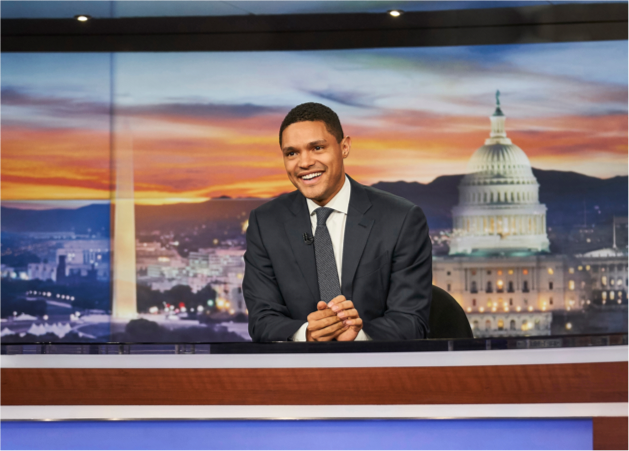 Photo credit: Jonathan Shook. “They always tried to deter people from painting down there but because it was such a vast space, it opened up a certain adventurous mindset as a kid,” he said. And this is the strange story of the LA River -- on the one hand a brutal concrete gash, and on the other, a source of affection and inspiration, especially to artists like SABER. One artist who took on the brutal inequalities of Los Angeles is Judy Baca, the artistic director and founder of Social and Public Art Resource Center, or SPARC, in Venice. She made one of the river’s most famous installations -- specifically in one of the river’s tributaries, the Tujunga Wash drainage canal in the San Fernando Valley. It’s called The Great Wall of Los Angeles. It is a mural, it is half-mile long, it was started in 1974 and is still being worked on today. Four hundred youth volunteers worked on a painting of the collective history of Los Angeles. Baca was inspired by a young man in East Los Angeles who had a series of wounds on his body from gang warfare. He pulled up his shirt and said, ‘look at me. I'm a map of scars.” He asked Baca to create tattoos to mask the scars. Meanwhile, another Angeleno was drawn by the siren song of the flood control channel. “I started Friends of the Los Angeles River as a 40-year artwork to bring the river back to life. I’d been involved in poetry and politics and this brought that together for me,” said FOLAR founder Lewis MacAdams. Part of the challenge initially for MacAdams was simply linguistic, to rename the flood control channel a river. “I mean part of our role has always been to make the invisible visible, and that's the nature of the work, because the river was invisible and now it's less so every day.” FOLAR became an advocacy group with thousands of members. They helped push for the L.A. River Revitalization Master Plan, a major planning document a decade ago, and for federal support to green the river. Fast forward to now and you’ll find bike lanes aligning parts of the river. People are kayaking, and they are making music inspired by the river, like Andrew Bird. And they are camping at the river. Kat Superfisky, of Studio M-L- A was at the first camp officially allowed at the state- owned Bowtie parcel. “The river is a 51-mile spine that cuts through that second largest urban area in the United States and outlets into the largest water body on the planet. That's significant. And so we as the next generation have this amazing opportunity to actually utilize the river as this kind of laboratory of sorts to figure out how to bring together a bunch of different demographics, how to think about ecology at the same time as the economy... So I really see that all of those different threads of life are woven together in the L.A. River. It is just waiting to be unearthed,” Superfisky said. Superfisky works with landscape architect Mia Lehrer, who has won the commission to turn an old railroad site at the river into a park. But this is one of the parks that’s bringing a new concern. “There is the possibility that with the green improvements, new parks, there could come green gentrification,” said UCLA environmental historian Jon Christensen. We’ll learn more about that on next week’s episode of “Bridges and Walls” on DnA. Bridges and Walls is supported in part by the California Arts Council, a state agency. And special thanks to NPR’s Story Lab. DnA Goes Camping. . . On the L.A. River? Can the L.A. River Avoid "Green Gentrification"?